We love the hypnotic and creative energy of our boho inspired brides. You know how to artfully create luxury from chaos. And your wedding style should be an extension of who you are – effortless chic! So when it comes to your bridal hairstyle, an elaborate, up-do isn’t quite up your alley – or should we say winding nature path? If you’re used to wearing your hair out everyday, having your hair swept up into a tight formal bun probably won’t make you feel like your most beautiful. 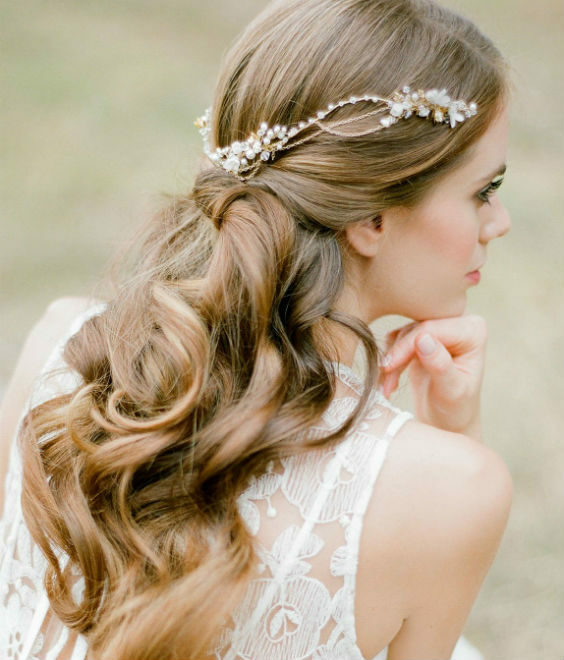 If you’re a less-is-more kind of girl, you’ll want your wedding hair to be unfussy, loose and minimal. You still want to feel utterly beautiful on your big day so go for undone styles, simple braids, pretty hair pins and headpieces. We’ve plowed through Pinterest and gathered some inspiration to help you find the ultimate boho bridal hairstyle for your day. Simple and effortless, long loose wavy tresses will ensure you still exude an element of luxury. For a variation on this classical style, try a smidge of sea-spray for a more messy look, opt for a dramatic side part, or tuck a section behind your ear. Is there anything more bohemiem than the halo? Delicate, understated and just a tad unpredictable – we can’t get enough of them. If you’d like to make more of a statement, why not consider a bridal crown? Wear a halo or crown with your hair out, swept to the side, or team it with a veil. Deconstructed braids, twists and half-up hairstyles add a touch of decoration to an otherwise carefree style. They create a subtle point of interest and can help provide structure should you wish to wear a hairpiece, veil or a smattering of tiny elegant flowers throughout. 1. If you can, work with a hairdresser to get your perfect style. Discuss the length and thickness of your hair, and how to care for it prior to your wedding to ensure your luscious locks are looking their best. 2. If your having a destination wedding, and you’re not sure if you’ll be able to communicate with your hairdresser effectively, bring LOTS of pics. A picture speaks a thousand words. Take examples, create a Pinterest board of inspiration, snap some photos and let your imagery do the talking for you. 3. If you’re going to do your own hair… practice, practice, PRACTICE! Don’t wait until the night before or the morning of to get your braids just right. Try YouTube tutorials – especially Kate from the Small Things Blog. Her tutorials are super easy and beyond beautiful. You’ll be mastering your hair in no time. 4. Make sure you have all the right tools. The ultimate loose wave and many other perfectly imperfect styles require the right products. It’s funny how messy hairstyles often require more products and tools than the sleek ones.